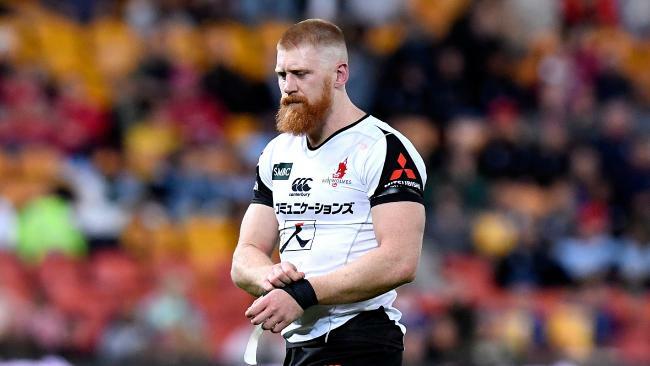 SUNWOLVES flanker Ed Quirk has been issued with a two-week ban for the "love tap" that saw him controversially red-carded in Friday night's Super Rugby clash against the Queensland Reds. And Reds back-rower Caleb Timu has copped the same suspension for another incident in the match - but neither will actually miss a single minute of action for Super Rugby franchise or country. SANZAAR's foul play committee handed down the sanctions after hearings on Sunday evening but the suspensions cover time periods, as opposed to matches like in most professional sports. With the Reds and the Sunwolves failing to qualify for the Super Rugby finals, the bans will only prohibit Timu and Quirk from playing club rugby. Quirk applied his closed fist to Reds five-eighth Hamish Stewart's face while both players were at the bottom of the ruck, but did so with such minimal force that both coaches were left in dismay and fearing for the future of the sport. A former Queensland player, Quirk was deemed to have committed "physical abuse", contravening law 9:12, which includes striking with the hand or arm and pleaded guilty. Reds coach Brad Thorn used the "love tap" description after the match and said such pedantic decisions "hurt the game" while Sunwolves counterpart and fellow ex-All Black, Tony Brown, called it "embarrassing". Timu, meanwhile, also entered a guilty plea after he was yellow-carded for laying a shoulder into a prone Sunwolves five-eighth Hayden Parker - an incident which Brown said was far more deserving of a red. SANZAAR deemed both acts merited a four-week ban but reduced them by half because of their clean judicial records. However, a SANZAAR media release on the matters on Monday listed different end dates for the suspensions despite them being the same length. Timu's ban ends after July 28 while Quirk's extends for an extra week to August 4. SANZAAR has been contacted to clarify the discrepancy.